The Lions are taking over Brisbane this week! In the lead up to our first home game at the Gabba, the Lions will be out and about making noise around Brisbane to get everyone excited for the return of footy - and you can be part of it! With a number of fantastic initiatives planned for the week, we wanted to let you know first, so that you can take full advantage. Check out some of the ways you can be part of the action below! 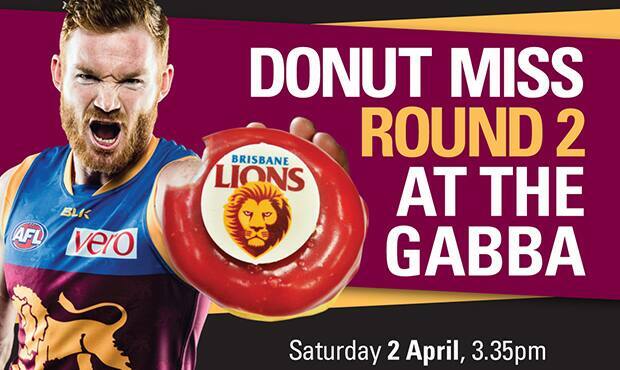 Get down to the Brisbane CBD on Tuesday 29 March, to secure one of only 3,000 official Brisbane Lions doughnuts! The Lions have partnered with delicious purveyors of doughnuts, Donut Boyz, and will be handing these out along with a complimentary* ticket to our first home game for the season against North Melbourne this Saturday at the Gabba. Make sure you head to one of three locations in the Brisbane CBD; Queen Street Mall, Roma Street Station or Eagle Street Pier, to nab your limited edition Brisbane Lions doughnut from 4pm tomorrow! Fancy yourself a bit of a speed demon? Here's your chance to pit your speed against the Brisbane Lions' best in the Brisbane Lions Beep Test. Get down to the Brisbane Botanical Gardens on Thursday 31 March from 12.30pm and you can meet players Allen Christensen, Lewis Taylor and Michael Close, as well as racing the clock to win some great prizes! Members will have their first chance this year to catch the boys in action at the Gabba at an exclusive member open training session this Friday 1 April. Entry is via the Queensland Cricketers Club at Gate 4 from 8.00am (training commences at 9.00am). Hang around after training to nab an autograph or a photo with your favourite player! On Friday night the iconic Story Bridge will turn maroon, blue and gold in honour of the Brisbane Lions 2016 return to the Gabba. Make sure you find yourself a nice vantage point, pack yourself a picnic and take some great photos as this is a first! Upload any pics you do take to social media with the #GetToTheGabba for your chance to win a prize! *Terms and Conditions apply (T&C's can be found on the ticket itself).